Faith stretched her legs restlessly, doing a few last-minute stride outs. At the starting line, she joined the other runners wearing their tiny colorful spandex uniforms. They were just as jittery and anxious to get started as she was, but they all tried to look intimidating, pretending to be oblivious to each other, and acting as runners do by shaking, bouncing, stretching, and swinging their arms and legs around. Finally, an anonymous man holding a megaphone announced something, stepped in the side of the track about twenty-five meters ahead of them, raised both arms, and fired the gun. The clock started. 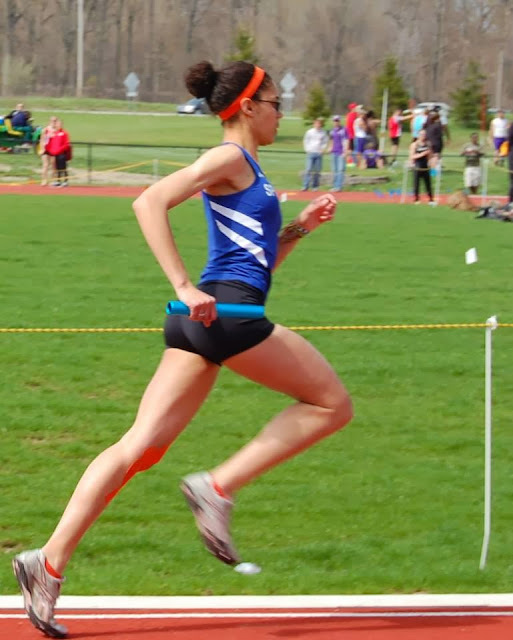 She needed to shave off less than a second to reach a qualifying time for the NAIA Championships that year. Two laps around the track, just over two minutes, was all she had. The 800 meter race is brutal punishment on the body, arguably the brutalest. It is just long enough to be considered middle distance, but only just. The distance is more like a sprint: a long, drawn out sprint refined only by raw, gritty endurance. You might not understand how people can consider running more than merely keeping the body in continual motion for miles (or laps) on end. Yet since the dawn of its popularity in the 1970s, running has inspired a movement that hasn’t stopped sweeping across America. Some seem to truly love going out and abusing their bodies. As you watch them facing the elements from the comfort of your living room window or from behind your windshield wipers, you write them off as clinically insane. In all honesty, you’re right; the art of running (because truly, it is an art) requires a certain level of insanity. Sometimes waking up is difficult. It was Monday morning; I was groggy and reluctant to peel the sheets off myself, even though my whole body felt incredibly warm from the summer heat wave engulfing my room and the entire west side of Michigan. There was only one driving force that brought me to my feet: hunger. I found my way to the kitchen and began preparing my breakfast. Someone had left two teaspoons of milk in the carton; I sadly watched it drip onto my cereal. Grumbling, I added lukewarm water from the tap. When breakfast was over, I knew what was coming: the two hour countdown began. I sighed, dwelling on how clean I felt and how ridiculously hot it was outside. I seriously considered not going, reminding myself of all the other things I wanted to do. Still, unless I died or severed my limbs before 9:00 am, I knew I would be running. “You have a gift, I believe in you, you can do this.” Coach Hoffer looked into Faith’s eyes with kind, unshaken confidence. This was her senior year in high school; she was at the UP finals and getting ready to break the record in the 800. Mandy Long, the current record holder, had gone on to the Olympic trials. Faith wondered, What would it feel like to break the record of someone who tried out for the Olympics? She held onto his words. At the starting line, his voice seemed to defend her mind against the barrage of mental weakness and doubt. She didn’t beat the record that day, but she won the race. That race showed her how far she had come from where she had started. After the race was over, she ran and threw her arms around Coach Hoffer. He had believed in her, he had seen her potential. Originally, running was primarily a competitive sport practiced only on the collegiate or professional level. Non-competitive running didn’t boom in the U.S. until after athletic celebrities like Steve Prefontaine and Joan Benoit broke through the media’s national consciousness. Groups like “Road Runner’s Club of America” were organized, magazines like Sports Illustrated began publishing studies vouching for the physical and psychological benefits of jogging, and runners like William Bowerman and James Fixx began writing and publishing on their own experiences with the rediscovered form of physical recreation. Part of the beauty of running is in its simplicity and accessibility; some would claim you don’t even need shoes. My body naturally prefers the minimal amount of discomfort and exertion yet my mind is always going, constantly reeling thoughts around in my head, and never sleeping; therefore, when I run, two worlds—my body and mind—clash. Running is actually a lot like sleeping. Often, especially as a child, I was resistant to sleep; I thought there were so many better, more exciting or useful things to be done. Yet every night I am forced to submit myself to physical rest; my body demands it and there are brutal consequences if I don’t. While I do not need daily intentional physical excursion to survive, the same mentality holds true with my body and running. It’s why running is growing in popularity; being active is the great equalizer to an otherwise quite sedentary life. Sleeping is commonly connected to the predominant paradox of “death” and “rebirth” and so should running since, fundamentally, no one actually loves to run, yet it does transform the body, like sleep. When I go out and run, I forget about what I think I want. Faith felt a burst of excitement rush through her as she looked up into the woman’s face. “Feed the horses?” She repeated, “You’re going to let me feed the horses?” She had just finished her first lesson at Tree Vine’s Equestrian Stables. Vicki nodded her head. “Yeah, come on, I’ll introduce you to everyone.” Trying to hide her excitement, Faith followed the woman into the stable and observed her take armfuls of hay and pile them into the feeding troughs. “Your turn! You can feed Bruce.” Vicki indicated to the bale of hay by the door. Faith gathered the biggest stack she could hold and followed Vicki into the next stall, being mindful of the enormous horse, and got on tip-toe to throw the hay in the feeder. After the pile landed successfully, Faith reminded herself to stop tip-toeing and walk out of the stall on her heels. It was hard to remember to walk on her heels. She had been introduced to therapeutic horseback riding as a means to loosen her calves. Riding appropriately would force Faith to push all of her weight down on the bottoms of her feet. This, along with her mother’s constant reminders to “walk flat-footed,” eventually would moderate her stride. Faith was born with cerebral palsy, a condition caused by a lack of oxygen to the brain at birth, resulting in disabilitated muscle coordination known as spastic paralysis. There are different levels of severity within cerebral palsy; some are completely unable to walk, while others may have subtly reduced range of motion at various joints in their bodies due to muscle stiffness, or minor challenges in muscle coordination in specific areas. Faith’s disorder affected her legs. As a child, her tight calves forced her onto her toes. The doctors told her parents she would be able to walk, but would never run well. For Faith, a lifetime walking on her tip-toes wasn’t a death sentence. Running didn’t have to be a monumental aspect of her life; nevertheless, since she was young, her parents constantly reinforced that her “disability” should never define her. As a result, she wasn’t afraid to pursue running. She loved being able to do something so many people told her she couldn’t. The running movement in the U.S. moved Americans to more than merely a new recreational activity. The movement granted the average individual the ability to run for the sheer enjoyment of it. Running is a daily reminder of how undeniably human we are, stuck in the blunt reality of each inauspicious moment, connected to the earth and its seasons, and responsive to (albeit resistant of) self-induced suffering. Running is in fact a gift that is not equally distributed. The psychological demand is just as ominous as the physical, which is why running takes skill (no matter what other athletes will tell you) and a lot of practice. If you've ever heard the phrase "I just love to run" you might’ve felt dismayed. In reality, there doesn’t seem to be anything magical, exhilarating, or life-changing about going out on the road, especially at first. Actually, it has great potential to bore, exhaust, and/or frustrate you, which is why it is understandable that you might have given up on it a long time ago. Beyond boredom and frustration, there could be other reasons you stopped; running is time consuming and it requires access to safe routes and a healthy body. Yet, if you don’t see the value in commitmenting to it daily, if you can’t see past the act of running and realize what running has the potential to become, and without an outside obligation to keep you going, you will undeniably always find a reason not to lace up your shoes. Two hours later, after much more deliberation, I double-knotted my Mizunos and walked out the front door, embracing the sun’s overbearing, ever-present radiation. I squinted from the sudden brightness and crossed my arms over my chest as I walked down the driveway, resisting the urge to turn on my heels and go back inside. My bitter resistance dissolved moments after my first strides. Despite the soaring temperatures, this was glorious. I could smell freshly cut grass and heard the drone of a lawnmower, provoking moments from my memory I could only equate with summertime and childhood. The neighbor’s horses were in the front yard and looked up from their grazing, studying me curiously. Dogs barked in the distance and the birds were calling to each other and flying overhead. The further I went into my run, the more vivid my surroundings became, and the more responsive and aware I was of my body. The landscape evened out into hundreds of corn rows, broken up by occasional driveways leading to small farmhouses planted on wide open yards. I was sweating and began to feel the burn in my legs and lungs, but it was good to be a part of the sweeping panorama of bright sky and the dusty ground around me. When I checked my watch after mile two, I reminded myself it was supposed to be an easy run, yet couldn’t help feeling a little disappointed by my pace (it was a bit slow). I felt myself picking up speed, focusing on the horizon. I imagined I was already there, somewhere in the distance; now I was just waiting for my body to catch up. As I ran, I created my own opposition. Essentially, I was the opposition, the competition, which fundamentally distinguishes running from other sports. I had to know when to compete, when to challenge myself, and when to hold back. At seven years old, she ran her first race. It was 5k memorial run; Faith placed first and set the record in her age group. From that time on, running became a driving force in her life. She ran cross country in middle school and discovered track in high school. Initially, Faith wasn’t planning on running in college. She was looking into Michigan State to become a veterinarian, but a change in heart and circumstances brought her to Spring Arbor University, where she competed on the track and cross country course. Currently, Faith is ranked second in the top ten list of fastest girls to race the 800 in Spring Arbor University’s history. Over her collegiate career, she has qualified in multiple events in every indoor and outdoor NAIA Championship since her freshman year. As a runner, I have found there are psychological stages runners go through, including the apathy and/or resentment toward it that you can probably relate with. The fundamental question to ask is why you wanted to run in the first place. Did you want to lose weight or get back in shape? These reasons are valid, but perhaps limited. You will reach a point when physical fitness or appearance just aren’t enough to get you out the door anymore; too often it feels much more preferable to remain still and comfortable inside than face the physical excursion that comes with running outside in the elements. You’ll reach a point when you’ll have to be honest with yourself: do you really even want to start running or is it a popular idea you felt drawn to? Running cannot be a fashionable trend; trends die too quickly. A love for running begins with the hope of improving not only the body, but the mind…for the mystical “runner’s high” we all hear rumors of. As I was moving, it felt like there was kinetic energy in my brain propelling me forward. I didn't have to think about moving forward as much as I had to think about stopping. My body accepted the motion and continued to be in motion until I decided to stop. It was my mind, not my body, that was carrying me; not merely my mind, but a subconscious part of my mind I had stopped controlling. During every run like this, I was reminded that I was not in absolute control; I was forced to acknowledge not only my body’s power and weakness, but my rudimentary connection with it. Eventually, as the “kinetic energy” in my brain continued moving my body, my mind was freed up and entered into a dream-like state where I forgot where I was and what I was doing. The secret to staying motivated to run, and maybe even loving it, actually has very little to do with the act of running. In essence, it is the perception of yourself in relation to running that must change. Running cannot be about you. It cannot be about how fast you can go, or how long, or what it makes you feel. Running must be about daily practice, about understanding the value of self-denial before and during each run, which is similar to the nightly submission of sleep: from “death” to “rebirth.” The value of running is in its consistency. When you consistently practice running, it becomes an art. This is why you should love running: you should love it precisely because, in all rationality, you should not love it. You should want to run because everyone (including yourself) tells you that you can’t. It is insanity, it is self-inflicted suffering, and this is what makes it so rewarding. There is a voice inside your head that will get in your way (that already has gotten in your way) even before you take your first step out the door, saying, "I'm too tired," or "I don’t want to," or "I can’t." That’s good. Recognize that voice, then go ahead and run anyway. During the run your brain begins demanding that you stop, that you give up, that truly you just can’t do it. This is your great disabler, your very real disability: you are afraid to see past your love for comfort; you are intimidated by the true meaning of bodily discipline. Yet if you’re honest with yourself, you love that you can making that voice squeal. It gives you no small sense of satisfaction to see that you in fact revel in the submission, that it frees you rather than binds you, into a higher state of being. You would begin to see that that voice is a lower, baseless shadow of who you really are, who you actually have the potential to become. In the distance, I could see my little white and yellow mailboxes poking out of the side of the road. As I closed in the space, I gradually continued gaining speed, reaching the driveway in nearly an all-out sprint. Passing the mailboxes, I stopped immediately, experiencing an infiltration of calmness and clarity as I slowly walked back up my driveway; the Zen-like “one with the body” and “one with nature” awareness was coursing steadily through my brain. The name for this feeling was prescribed in the 1970s: endorphins. Endorphins are chemicals released from the brain after exercise, connected to positive mood change. The more endorphins released by the brain, the more euphoric the experience, known as the “runner’s high.” For the majority of running history, the “high” remained only a hypothesis based on runners’ claims. Finally, in 2008, advancements in neuroscience enabled researchers in Germany to report that the hypothesis is true. Their publication in the journal Cerebral Cortex confirms that a flood of endorphins is triggered in the brain after a run. Yet somehow, even getting high (or the propensity to get high) on running is often not enough motivation to keep me going out and doing it. After I graduate from college, without an obligation to a team or sponsor, as a non-competitive runner, I will soon face questions: why continue running? For what purpose am I dedicating so much time and to what end? Faith nodded. She studied Savannah a moment, who had turned her head disjointedly to face the door, waiting for her mother to arrive. The girl’s body remained motionless, buckled in her wheelchair. Her head rested on the cushioned back of the seat; the rubber and metal wheels and black leather seat contrasted sharply with the old, weathered wood and bits of straw surrounding her. In between college semesters, Faith had returned to work at the therapeutic horseback riding camp she had taken lessons from when she was young. She had just finished helping Savanna with a riding lesson. The little eight-year-old’s cerebral palsy affect her muscle coordination from her neck down, and getting on and off the horse proved difficult. “Savanna,” Faith waited until the little girl unsteadily turned her head back and made eye contact, “I enjoyed my lessons just as much as you did. Keep up the hard work, you’re doing so well.” The girl looked at Faith with her large, brown eyes and timidly returned a smile. Savannah's mom arrived to take her home. As Faith watched the girl being pushed out of the stable in her wheelchair, the realization struck her: that could’ve been me. The image of the girl’s tiny uncoordinated body burned into her mind. I’m not supposed to be here. She thought. I’m not supposed to be able to run. Thanks Hannah. :) That means a lot. Well done, Danae! Once again, you bring me to tears. You are a gifted writer!